Notes: Two miniature sheets on the same cover, both depicting royal residences make this a very unusual and collectible item. Last year (2016) I produced a similar cover featuring the Queen Mother 100th Birthday miniature sheet + the Queen's 90th Birthday miniature sheet. These were very popular. The above Royal Mail Windsor Castle stamps were issued on 15 February 2017 by Royal Mail and feature the following stamp designs: 1st The Sir Reginald Bray Roof Boss; 1st Fan-vaulted roof; £1.33 Garter banners; £1.33 St George’s Cross roof boss. 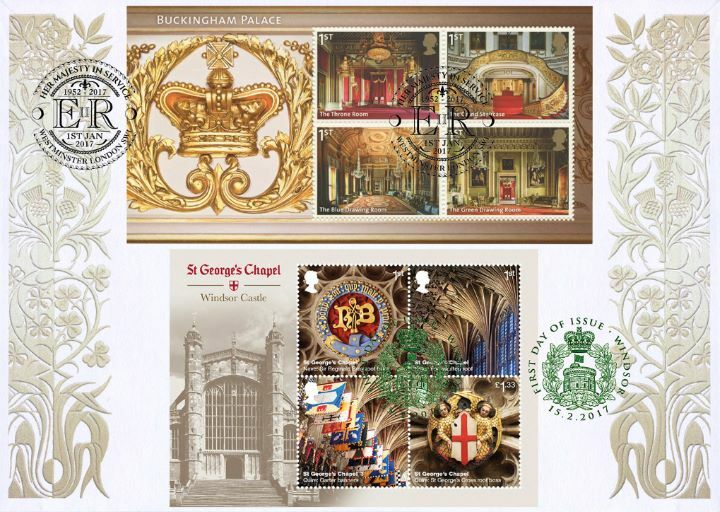 The Buckingham Palace & Windsor Castle first day cover with the Windsor, The Round Tower, Special Handstamp postmark has been produced by Bradbury and features these stamps which can make a very collectible and lovely gift.